If you've ever wondered why your rental doesn't quite look like home, then you're on to something. Rental life comes with stuff - it just might not come with storage. No matter how you arrange your furniture, it just doesn't seem to look quite like you want it to. This may be because a lot of the "stuff" you would have had tucked away in a large home doesn't have a home anymore. You have things here and there and well, everywhere. There's a cure for the lack of built-in storage. Adding storage and removing clutter will really change the look of your rental. The best part is that portable storage can move with you to your next home. Don't let the single bathroom cabinet in your apartment stress you out. You can conquer countertop clutter with these tips. 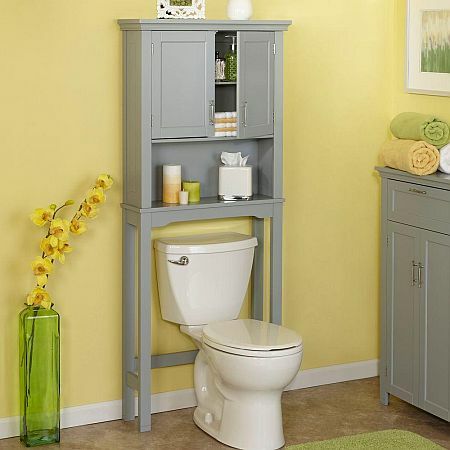 Consider a freestanding over-the-toilet storage unit. These are also sometimes called a spacesaver or an étagère. These typically give you a combination of a cabinet and shelves or all shelves. Use them to hold baskets of toiletries and stacks of folded towels. There are also rolling shelves that glide in between the fixtures and pull out as needed. Take advantage of every inch of space in your vanity by adding cabinet organizers. Pull-out baskets will help you reach supplies deep in the back of the cabinet. You can even hook an organizer on the inside of your cabinet door to hold bulky items like hairdryers. If you need inspiration for sprucing up your vanity, take a look at how one vanity can be styled in multiple different ways. Don't forget the back of your bathroom door. Use this spot for an over-the-door rack of shelves for products or a towel rack for extra towels. It's really important to create storage where there is none in this room so it doesn't look cluttered. If you are still shopping for furniture, choose options that offer some storage. Get an ottoman with a lift-off lid and use it to hold board games or extra linens. Pick an entertainment center that has additional cabinets or shelves you can use for books and other items. Create an attractive home for coats by adding a coat and hat rack to the wall. Below it, tuck a decorative piece, like a wooden box or wicker basket, to hold boots and shoes. Use baskets to keep things tidy. A seagrass basket makes a nice display for magazines and another one makes a great way to tuck video games and controllers out of sight by the TV. If you love to cook, you might find placing all your kitchen gadgets in an apartment a puzzle. If you use some organizing tricks, you should not have a problem. Free up drawer space by placing a crock of cooking tools next to the stove. Place a large basket on top of the fridge that you can lift down as you need it. Put things in it that you need and use, but not on a daily basis, such as baking supplies or serving dishes. Get a baker's rack or shelf to set in your dining area, but use it as kitchen storage. By arranging items on it that are decorative and attractive, but still useful in the kitchen, you free up valuable cabinet space. Try displaying serving trays, pretty bowls, pitchers, cookbooks, coffee mugs and stemmed glassware. Use cabinet organizers to maximize space. Small shelves that go inside your cabinet will allow you to double up on things like plates, glasses or canned goods and fit more in one cabinet. The best rest is found in a bedroom that is peaceful and relaxing - that means one that is uncluttered. Even if your bedroom isn't seen by guests, you have a good reason to make this an organized space. Use your under-the-bed space for storage with some under-the-bed boxes. This is the perfect spot for extra shoes, off season clothing, sports equipment and luggage. Add a bed skirt to your box spring and it will hide all your stored items. If you are shopping for nightstands, choose some that offer drawers or shelves for extra storage. A bench with a lift-up lid is pretty and useful at the end of the bed. Inside it, store extra bedding and blankets or sweaters and purses. Maximize closet space by using the inside of your closet door for a shoe rack. Add a step stool so you can use all of the shelves easily. As you're setting up your home, you'll find the more you focus on creating spots to stow away your belongings, the more it looks like a home.